As some may know, the only way to get The Disappearance of Winter's Daughter has been via Audible.com or my own website. The reason has to do with a non-compete clause in my Legends of the First Empire contract, which prevented any books based in Elan to be published until a few months after the last book of that contract. Well, Age of War came out July 3rd, so we can now OFFICIALLY release the fourth Riyria Chronicle through the retail chains. So it's up for pre-order and books will start shipping on October 2nd. Joe Solari, who runs the podcast "The Business of Writing" was nice enough to have Robin and I on his show to talk about what we do with regards to my career. As the podcast went on, the theme seemed to be that our persistence and agility made it so we at least "Fall with Style" when things don't go exactly go "our way." When your small press publisher doesn't have the money for the press run of book #2...revert the rights and self-publish. Orbit won't make hardcovers of the Riyria novles...buy permission from them to make them yourself. When Del Rey puts the hardcover edition of Age of Swords out of print and price-gougers are charging readers $90 - $190 to get a copy...buy up all the stock with the help of an Indiegogo campaign and get the books back on sale at $22 - $28. A non-compete prevents any new Riyria books from being released for 3 years...produce them yourself and sell the books directly to readers (and earn better because you keep the high cut that retailers charge). There's plenty more, but instead of talking about it, why don't I just share the video? So here you go. I hope you enjoy. Robin and I have been having a little disagreement. Don't worry, it's nothing serious, but Robin is the consummate champion for the readers, and as such, she is always advocating for signed copies and other perks like custom bookmarks (and having those signed as well). Personally, I can't imagine that anyone cares if I sign a book or not, but, hey, that might just be me. As some may know, we took an extraordinary step and got the remaining copies of the Age of Swords hardcovers from Del Rey's warehouse when they put that title out of print. Over the course of two trips, I've signed more than 1,200 books (500 of which were Age of Swords), but there are still 2,700+ to go. Robin wants me to add my John Hancock to all of them, and I'm certainly willing to do so, but it does take time away from writing, and as I said, I'm just not sure whether people care. That's where "the experiment" comes in. 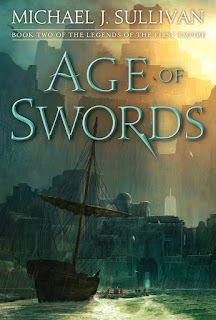 Below you'll find an order form for Age of Swords at the unprecedented price of $15 (which includes FREE US shipping). These will come straight from our fulfillment center without Robin or I touching them, so no signature, no bookmark, just the book and only the book - but it'll be nearly 50% off and since we are picking up the bill for shipping and handling, you'll get it for a fraction of the $33.99 this book usually sells for when buying directly from us. The hope is that many of you will take advantage of this incredible offer, providing a win-win for both of us. You'll get the book at a low, low price. They will leave the warehouse, so we don't have to pay for storage. We'll earn more money than when these books were bought from the bookstores, and I won't have to sign as many of them. Maybe Robin is right, and people really want signed copies, but I also think there are those who just like hardcovers, period. And if they can get a quality one at a great price, this will be a great opportunity. In any case, we'll see. If nothing else, Christmas will be here soon, and this would be a great chance to get a book for someone who loved Age of Myth but hasn't yet jumped into Age of Swords. I'm sure there are some people out there that fit that category, right? For those who are curious, I'll post the results of this little experiment in the future. Oh, and anyone who DOES want signed copies and bookmarks and what not, you can get a signed copy at 20% off until the end of the month as part of our Fantasy Fall Sale. 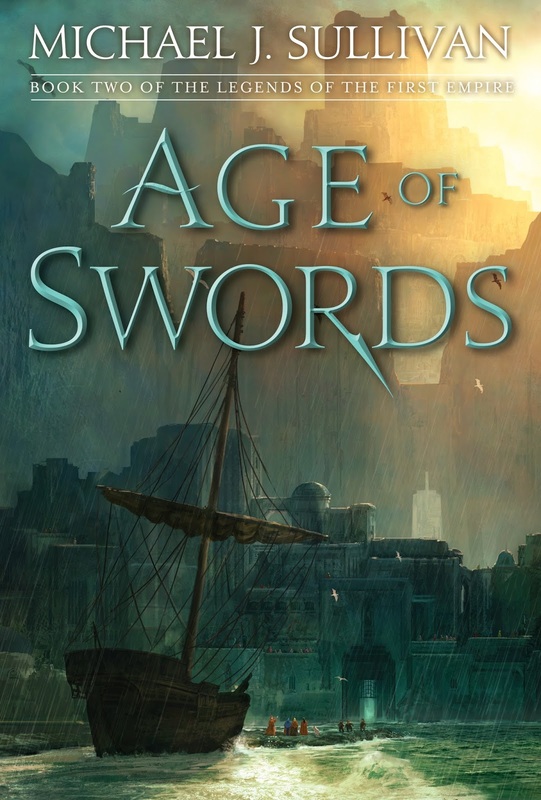 You can buy Age of Swords (and all my other hardcover books) from here. And one last note. For those who are curious as to why this is only for the US...well, shipping overseas costs more than we are selling the book for, and our out-of-pocket costs for this would be $31.06. So, we'd be losing $16.06 for each overseas order. We are assuming that if people are going to pay the high cost of overseas shipping, they'll want a signed copy with the other bells and whistles. Like I said, this is an experiment, and if enough overseas people write us and want unsigned books, we'll run something similar for you as well. So, that's it. I hope some people take advantage of this offer, it'll mean I have less books to sign, but if it turns out that Robin is right, I'll be more than happy to keep signing away. Either way, we, as always, thank you for your support. The fall sale has now ended. Thanks to everyone who participated, and I hope you enjoy your savings and the books!